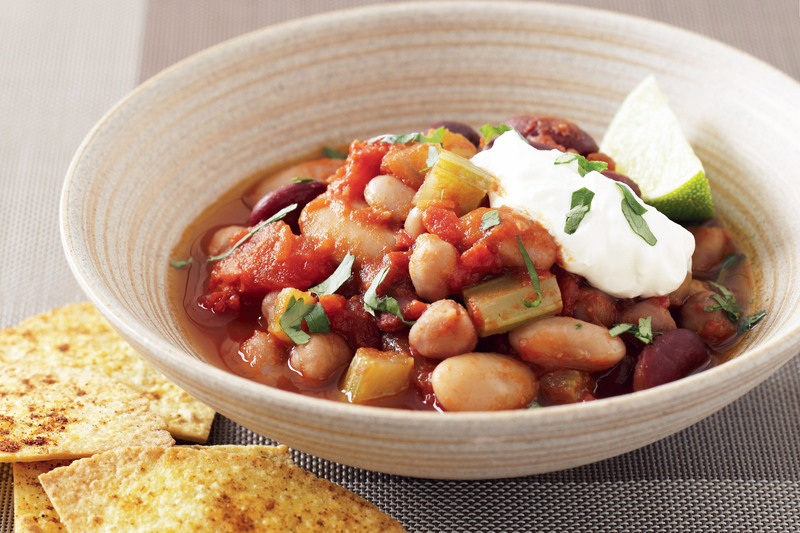 Sour cream adds a touch of indulgence to this protein-packed bean stew. To make the tortilla crisps, preheat oven to 200°C. Spray both sides of the tortillas with olive oil spray and sprinkle with paprika. Place on a large baking tray and bake for 5 minutes or until crisp. Meanwhile, heat the oil in a large saucepan over medium heat. Add the celery and onion and cook, stirring occasionally, for 6 minutes or until soft. Add the garlic and chilli and cook, stirring, for 1 minute or until aromatic. Add the tomato to the pan and stir until well combined. Bring to the boil. Reduce the heat to low and simmer, stirring occasionally, for 10 minutes. Add the beans and simmer for a further 10 minutes or until the beans are tender. Stir in the lime juice. Taste and season with salt and pepper. Divide among serving bowls. Top with a dollop of sour cream and sprinkle with coriander. Serve with the tortilla crisps and lime wedges. Freezing tip: Prepare the recipe to the end of step 4. Set aside to cool completely. Place in an airtight container. Label, date and freeze for up to 3 months. Place in the fridge overnight to thaw. Reheat and continue from step 5.